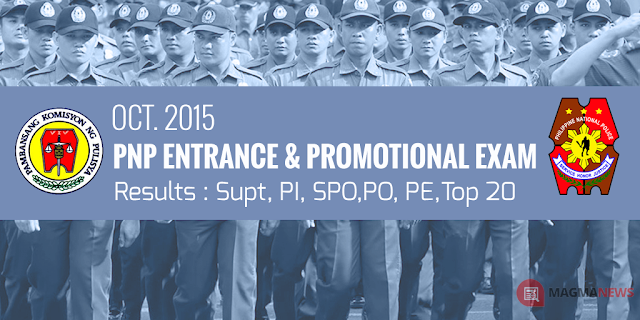 NAPOLCOM Named Top 20 PNP Examinees for October 25, 2015 - Exam News, Reviewer, Military Career, & Everything [MN] . .
Manila, Philippines - The National Police Commission (NAPOLCOM) named top 20 placers of the October 2015 PNP Entrance and Promotional exam for Police Officer, Senior Police Officer, Police Inspector and Superintendent. Standby for the results of the Top 20 examinees for the Police Inspector and Superintendent exams is yet to be released.